My guitar does not play in tune, even after I know I've tuned it correctly. Some chords sound in tune while others don't. This article details the reasons a guitar will not play in tune. To view information about "staying" in tune, please refer to my article on tuning issues. To check intonation you will need an electronic tuner. Tune your instrument to pitch and fret each string naturally at the 12th fret. If notes played at the 12th fret are dramatically sharp or flat, the intonation may require correction. Very high action (string height) causes a string to be stretched as it is fretted. In the same way that bending a string causes the note to become sharp, pressing a string down when the action is quite high will also cause string stretch. When string height at the nut is too high, chords and notes in the first position are often out of tune. Correction: The instrument should be properly set up. A neck with far too much relief (bowing in the neck) not only shortens the distance between the nut and saddle, it raises the string's distance from the frets. Correction: Adjust the truss rod to obtain proper neck relief and set up if necessary. The saddle should sit firmly in the bridge. A loose saddle can lean forward, shortening the string's length and sharpening the intonation. Correction: Replace the saddle for proper fit. Deep notches in the saddle may change the string's length. Correction: Replace or re-surface the saddle. Frets that are badly grooved or have flat crowns will also throw off intonation as the string's length is changed. Correction: Worn frets can be leveled and re-crowned to remove the grooves. Severely worn frets may require replacement. Instruments with very tall fret wire can play incredibly sharp if the string is fretted hard. Using an electronic tuner fret a note and watch the tuner as you apply more or less pressure to the string to view the effects. 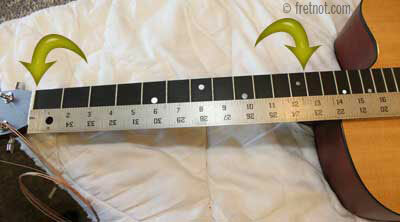 Correction: If the fret crown is very tall, fret leveling and re-crowning can reduce it's height. String quality has really only been an issue for my clients when purchasing no name strings from auction sites. While seemingly cost effective some are notorious for bad intonation. When re-stringing an instrument that has been properly set up it is important to use the same string gauge. Saddle compensation, neck relief and action have all been set for a particular string gauge. Increasing the tension of the strings can cause sharper intonation. Correction: If the instrument played in tune before and no changes have been made to the instrument you may wish to change strings first. The string is always resting in the nut's slot and on the saddle's crown. Changing the position of the saddle or nut will therefore change the length of the string. A string that is too long will cause the intonation to be flat at the 12th fret. A string that is too short will cause the intonation to be sharp at the 12th fret. Correction: The saddle's crown may need compensation or, in more severe cases, the bridge saddle slot may need to be moved. I hate to mention this as I fear far too many people will jump to this conclusion in error, but I still encounter this on occasion. This is generally seen on inexpensive imported instruments and some vintage pieces with hand slotted fretboard's. Some players have a rather powerful fretting technique in which they place excessive pressure on the strings when fretting. If the instrument happens to have fairly tall frets the combination often results in sharp intonation. To illustrate, use an electronic tuner and play a note using varying fretting pressure. The tuner will show you how your pressure effects the note. When trying to determine the Scale Length on an instrument measure the fingerboard from it's start (where it touches the nut) to the center of the 12th fret. Double this number to arrive at the Scale Length. end of the fingerboard, to the center of the 12th fret and doubling it. In order to compensate for the sharpening that occurs when fretting notes up the neck, additional string length is added to the scale length in order to provide better intonation. If you look at the saddle on a steel string guitar you will quickly realize that they are not in a straight line (with the exception of some classical guitars). Saddles are slanted because string length is actually added to the instruments scale length in order to off set the sharpening of the note which occurs when the string is stretched while being fretted. The larger the string, the more compensation is usually necessary, thus the bass side of the saddle will be further from the fingerboard than the treble side.